Product prices and availability are accurate as of 2019-04-23 22:51:31 UTC and are subject to change. Any price and availability information displayed on http://www.amazon.com/ at the time of purchase will apply to the purchase of this product. Our beaded Ruby Victorian pendant's vibrant colors add charming warmth to any room in which it is displayed. The large, flared shade is crafted of deep Ruby fabric that in a zigzag fashion. Just below, a wide band of blue grey fabric features a meticulously embroidered pattern in matching Ruby. 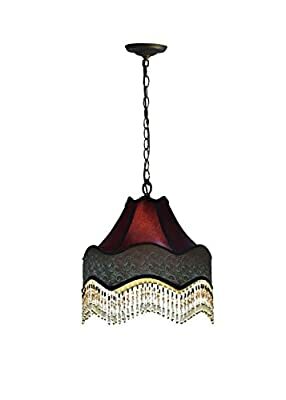 A lovely fringe with Ruby and amber beading around the shade's bottom edge adds texture, movement and extra sparkle when the pendant is illuminated. The fixture hangs elegantly from a round metal Ceiling canopy, wire cable and chain, all finished in lustrous antique brass that adds to the cozy warmth. Simply stunning over a large dining area, our beaded Ruby Victorian pendant will add vintage charm to your home well into the 21st century and beyond.